Just want to wish all my fellow teachers a Happy Teacher Appreciation Week! Although, I feel like my students are thankful all the time, it is nice to be celebrated for a week! Plus, it means freebies and sales... and you know I'm all about living life on the cheap. Tomorrow!... 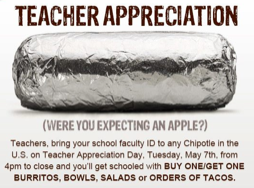 Tuesday, May 7th two great restaurants are offering deals for teachers. Chipotle is having BOGO burritos, bowls, salads, or tacos tomorrow if you show your school ID. It's start at 4pm and goes to close tomorrow. That's close to an $8 dollar savings! Thank you Chipotle! 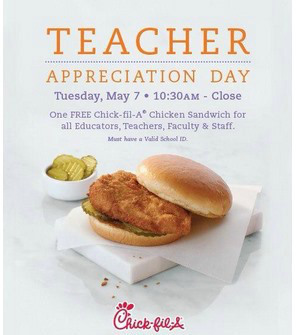 Chick-fil-A is also a teacher promotion tomorrow. Starting at 10:30 am to close teachers get a free chicken sandwich! Free is always a winner in my book! So don't forget to pick up your free burrito or sandwich tomorrow! You need your ID for both offers... so if you're like me, you have to mend it back together with some tape or dig it from your purse, drawer, etc. Then bust out that badge and claim your rewards! You've earned it!